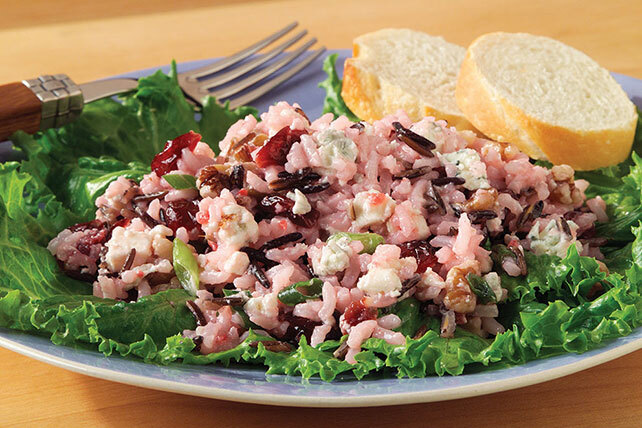 Add blue cheese crumbles, dried cranberries and toasted walnuts to a blend of long-grain white and wild rice to make this showstopping side dish. Cook rices in separate saucepans as directed on packages. Cool slightly. Mix rices, cheese, cranberries, walnuts and onions in medium bowl. Add dressing; mix lightly. Cover. Refrigerate at least 1 hour to allow flavors to blend. Serve on lettuce-covered salad plates. Did you know that wild rice is not a rice at all but a long-grain marsh grass? Stored in an airtight container in a cool, dark place, wild rice will keep almost indefinitely. Be sure to clean wild rice before cooking. Place the rice in a bowl, fill with cold water and stir a few times. Set aside for a several minutes to allow any matter to float to the surface, then pour off the water.